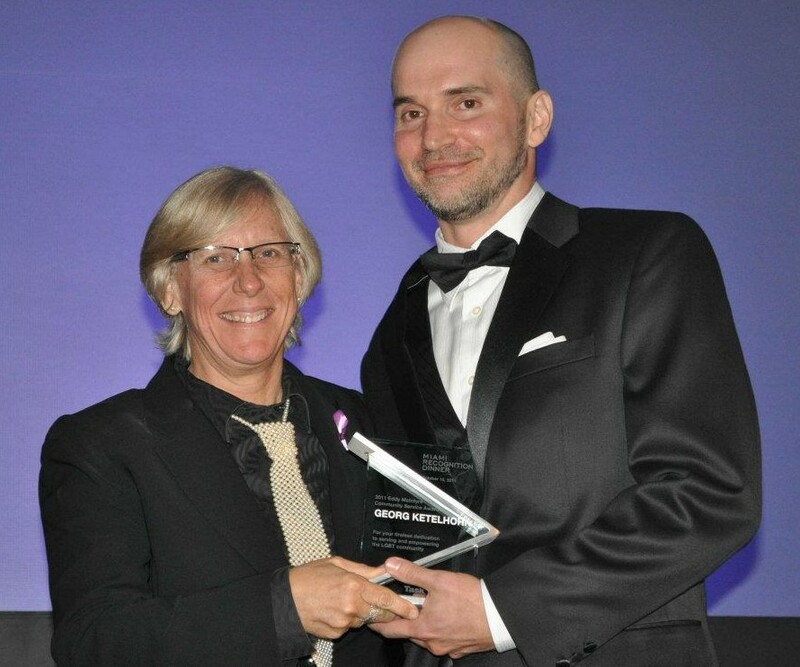 Pictured above is Georg receiving the award from Cindy Brown, last year’s winner, at the 15th annual Miami Recognition Dinner on Saturday, Oct. 15, at the Fontainebleau Miami Beach. More than 1,000 attended the event, including The L Word star Pam Grier; Task Force Executive Director Rea Carey; Andrew Tobias, treasurer of the Democratic National Committee; Miami-Dade Mayor Carlos Gimenez; and Miami Beach Mayor Matti Herrera Bower. In 2002 prior to joining our firm, Georg resigned his position as an associate attorney with another South Florida law firm where he had worked for more than five years in order to serve as the unpaid campaign manager for Save Dade’s successful “No To Discrimination” campaign, which defeated an attempt to legalize discrimination against lesbians and gays. Click here to read more and see additional photos from the event.